Fenerbahce Ulker Istanbul improved to 2-0 in Group C by downing PGE Turow Zgorzelec 76-91 in Lubin, Poland on Thursday. 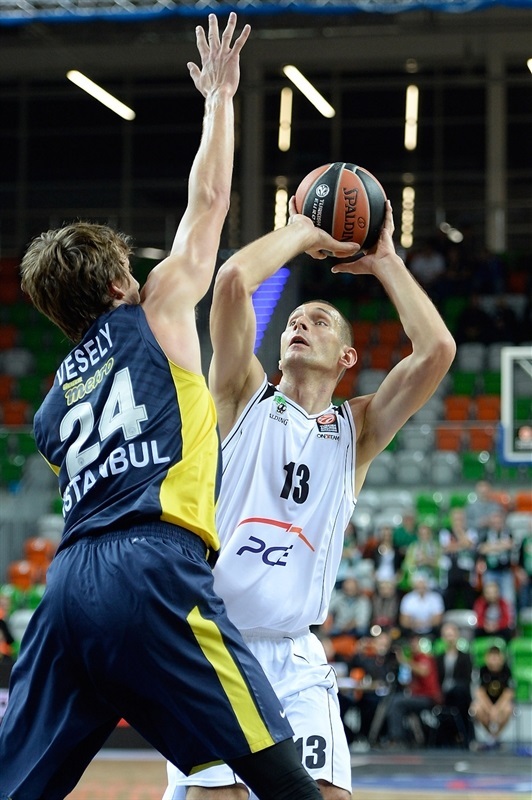 Fenerbahce tied FC Barcelona atop the standings, while Turow dropped to 0-2. Andrew Goudelock led the winners with 27 points. 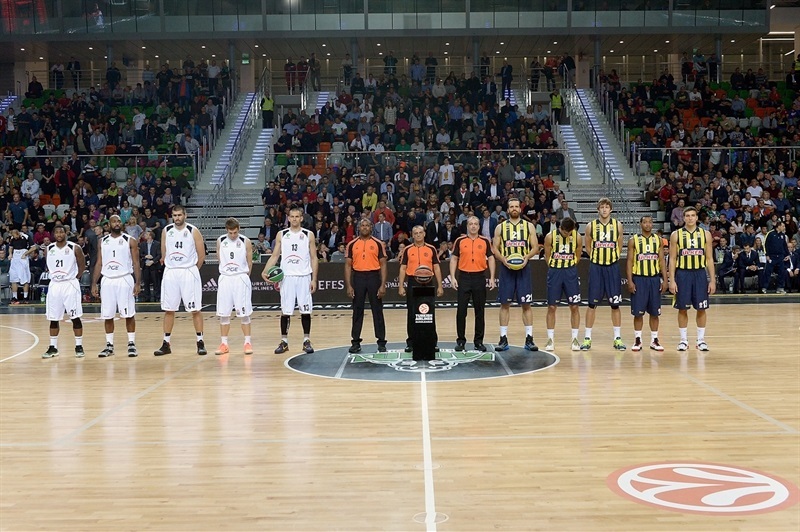 Emir Preldzic added 16 while Ricky Hickman and Oguz Savas each had 10 for Fenerbahce, which led from start to finish. 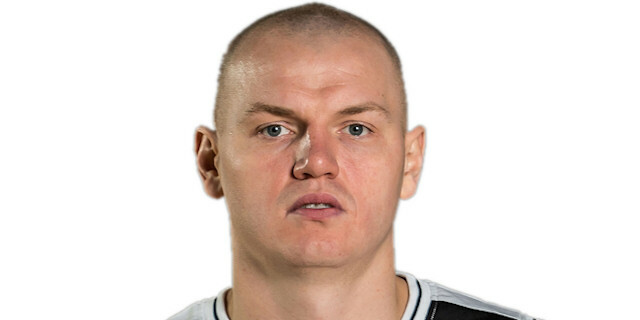 Damian Kulig led Turow with 23 points and 8 rebounds. Mardy Collins added 20 points and 4 steals, while Tony Taylor scored 12 points for the hosts. 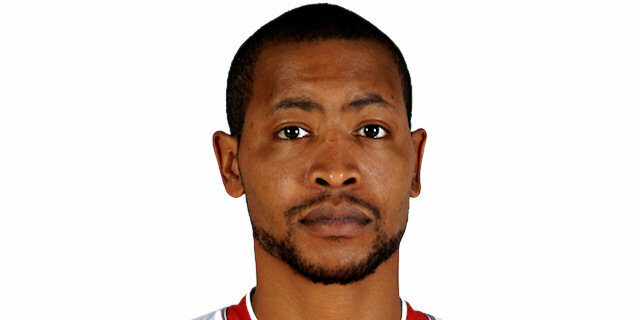 Goudelock led a 0-13 opening run, which Jan Vesely capped with a jump hook. A dunk by Semih Erden and a layup by Preldzic boosted the guests' lead to 15-30 after 10 minutes. Kulic and an outstanding Collins allowed Turow to get as close as 36-43 but Ricky Hickman helped Fenerbahce restore a 40-50 margin at halftime. 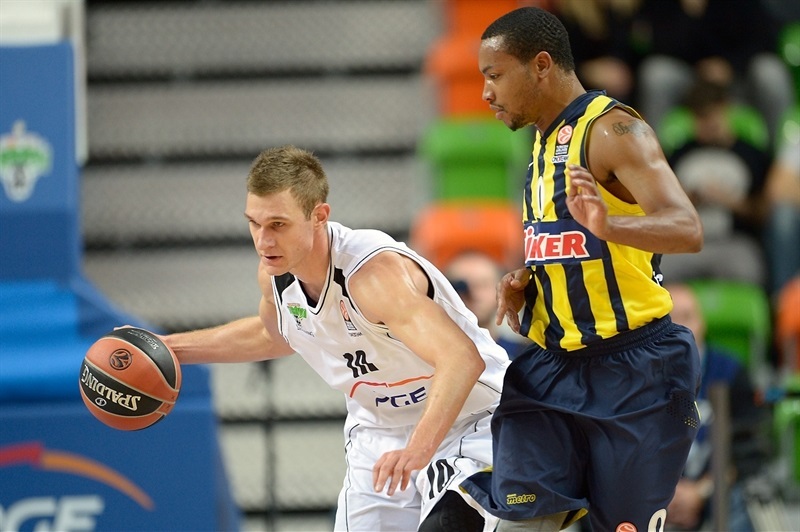 Goudelock and Preldzic allowed Fenerbahce to keep a 60-69 margin after 10 minutes. A three-pointer by Kulig brought Turow within 73-78 with 3 minutes left but Goudelock and Vesely stepped up in crunch time to make Fenerbahce keep a safe lead until the final buzzer. Oguz Savas got Fenerbahce going with a driving layup and Goudelock soon gave Fenerbahce a 0-7 lead. The visitors held Turow scoreless in the opening four minutes. 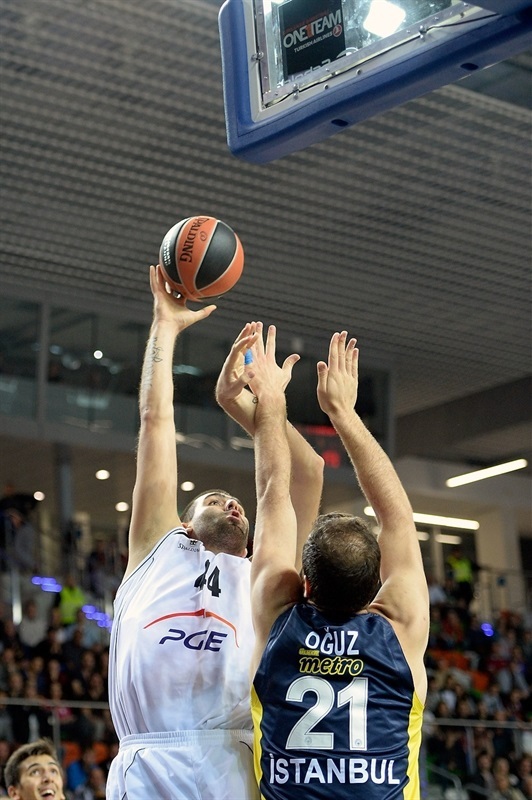 A dunk by Savas and free throws by Goudelock made it a double-digit game. A jump hook by Vesely capped a 0-13 opening run. Collins split free throws to open the Turow account. Goudelock nailed a one-handed floater and Bogdan Bogdanovic hit a mid-range shot, but Kulig followed a put-back layup with a triple to make it 6-17 Turow. Savas shined with a reverse layup and a long jumper by Goudelock made it a 15-point game. Turow found a go-to guy in Vlad Moldoveanu, who followed a six-meter jumper with a triple to put 11-21 on the scoreboard. Vesely split free throws, Kulig shined with a tip-in and a put-back slam by Semih Erden kept the guests way ahead, 13-24. Hickman and Kulig traded free throws, but an alley-oop slam by Erden and a buzzer-beating layup by Preldzic restored a 15-30 Fenerbahce lead after 10 minutes. Kulig kept pacing Turow with a three-pointer early in the second quarter. Preldzic shined with an up-and-under layup, which Nemanja Bjelica followed with a jump hook for an 18-34 Fenerbahce advantage. Collins scored in the low post, but Erden countered with a dunk. Preldzic took over with a five-meter jumper, but Kulig scored again. Goudelock soon gave the guests a 22-39 margin. After Collins dunked, Preldzic answered with a fast break layup. Free throws by Kulig got Turow within 26-41. Collins provided a highlight with a big basket off steal that caused Fenerbahe to call timeout at 28-41. Collins scored again off a steal. Preldzic dunked and a close basket by Kulig gave Turow hope at 32-43. Ivan Zigeranovic scored down low and a coast-to-coast layup by Collins made it a seven-point game. Bjelica and Hickman stepped up for Fenerbahce, but Zigeranovic and Taylor kept Turow within 40-50 at halftime. Collins swished a seven-meter bomb immediately after the break. 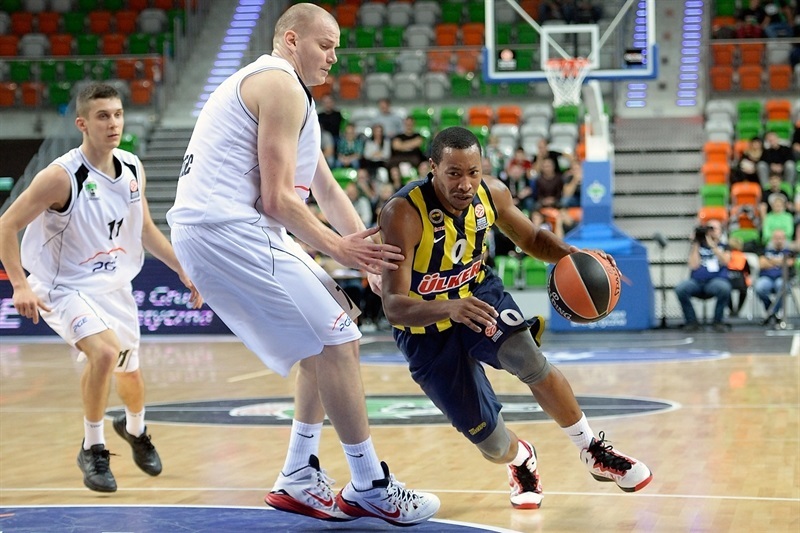 Goudelock shined with a step-back jumper and soon banked in an off-balance shot to give Fenerbahce fresh air at 43-54. After Taylor made free throws, Savas scored down low and a running shot by Zigeranovic kept the hosts within 47-56. Nemanja Jaramaz stepped up with a follow-up layup. Hickman and Taylor exchanged free throws and a three-pointer by Preldzic restored Fenerbahce’s double-digit lead, 51-61. Collins scored in the low post and erased Goudelock's mid-range jumper with a one-handed slam to keep Turow within 55-63. Vesely split free throws, as the guests improved their defense late in the quarter. Savas scored again, but Jaramaz followed a three-point play with free throws to bring the hosts closer, 60-66. Preldzic struck from downtown to boost Fenerbahce's lead to 60-69 after 30 minutes. Preldzic fed Erden for a one-handed slam early in the quarter and free throws by Bjelica gave Fenerbahce a 60-73 margin. Taylor stepped up with a corner three-pointer, but he didn't find much help. Bogdanovic stepped up with a big basket that Zigeranovic bettered with an acrobatic three-point play for a 66-75 Turow deficit with six minutes remaining. Erden split free throws and a jumper by Kenan Sipahi kept Fenerbahce out of trouble at 66-78. Collins scored off another steal and Kulig followed with a wild driving layup to keep Turow within 70-78 with over three minutes left. Kulig buried a three-pointer that forced Coach Zeljko Obradovic to stop the game at 73-78. Goudelock sank free throws and a dunk by Vesely sealed the outcome, 73-82, with two minutes left. 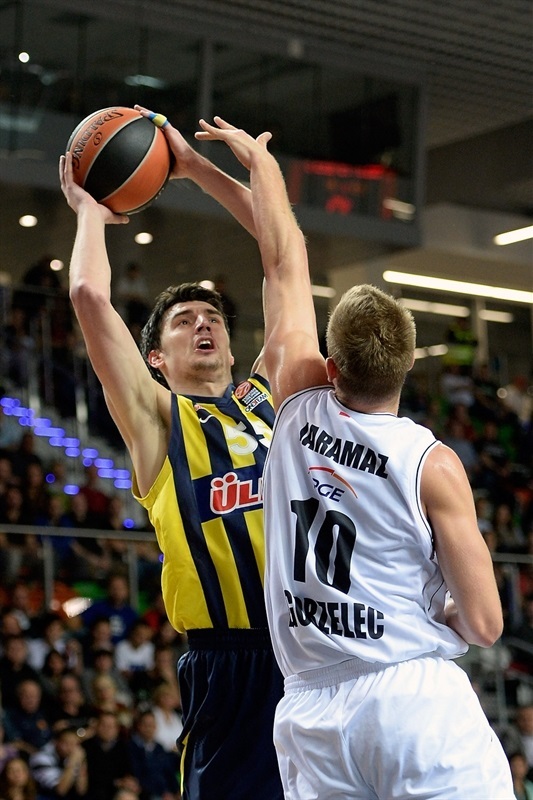 Turow kept trying, but Fenerbahce stayed focused and cruised to a well-deserved win. "In this moment we did our best. I wish Fenerbahce all the best for the rest of the season. We tried to interrupt their game, not to let them do what they wanted to, but you have to keep in mind that we played against one of the best teams in Europe. We had problems with offensive rebounds. It was a good lesson for us and I hope we will learn a lot from this game and will use that knowledge in future games." "This match we treated very serious. We knew about Turow in the Euroleague and how they played their first game very well. 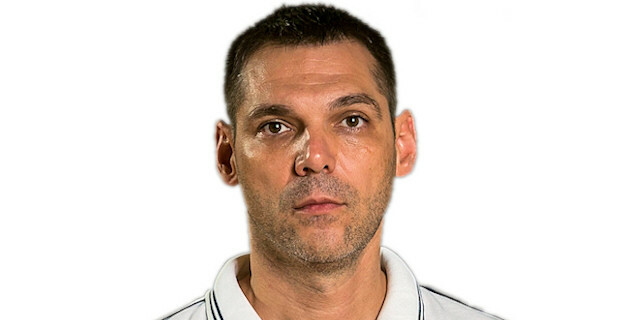 I told my players to forget that Turow plays in the Euroleague for the first time and be really aware of them. We started very well. We have to work on [turnovers], we cannot commit the ones like today. Turow showed character and showed us that they are very good team. " 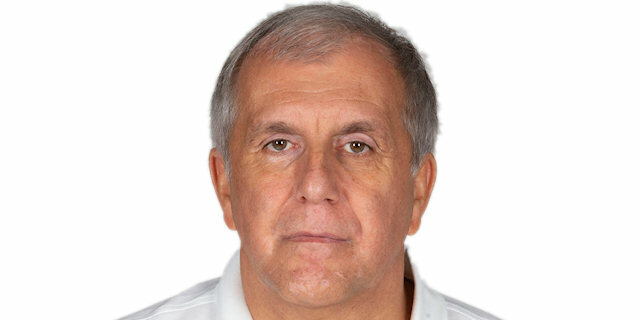 "Fenerbahce is very strong team. We failed at the beginning because we let them do what they wanted to. Then we had to make up for that for the rest of the game. We didn’t deserve this loss." "It was a good game for us all. I am glad that we did what we had to do down the stretch. We made it closer than it should have been, but every win is a win and we will take it. They were coming back, making a big surge and we tried to focus as much as we could. We lacking some little things sometimes - turnovers, losing concentration on defense, not remembering our offenses... We will be fine. It is only the second Euroleague game, we have a long way to go."